What is it about Kanon that causes me to absolutely need to watch it? This has been something I’ve wanted write/rant about for a few weeks now. Granted its visually stunning. Story-wise, its interesting. In terms of characters, from main characters like zombie Nayuki and her sleepiness to secondary characters like Jun and his Elvis impersonations, the quirks of the characters are endearing. But I still can’t explain why I want to watch this show. So consider this my rant about a Kanon addiction. Jeez, this turned out to be a long one. I haven’t seen this show so I recently picked up the DVD. The only volume out now has the first four episodes (obviously). Despite the name of the show (Fate/stay night? What the hell? ), I liked what I’ve seen so far. It centers on Nobel Peace Prize future recipient (not really) Shiro Emiya. A high schooler who gets involved in some life-death contest with magicians for the Holy Grail. One of these is magicians, a fellow high schooler, Rin winds up helping Shiro understand what’s going on. there are seven magicians who fight for the Grail and they each have a “servant” who fights for them. Each of these servants comes from a special class of fighters (why do I get the feeling that I’ll be watching an anime with card battles?). As luck (and the plot) would have it, Shiro sees Rin and her Archer servant fighting a Lancer servant. They notice Shiro and break of the fight to go kill Shiro. Its a rule to leave no witnesses behind. As the Lancer is about to skewer Shiro, there’s a flash of light and a blonde servant appears and fights off Lancer then Rin’s Archer. This new servant realizes that Shiro, despite having some weak magical skills that allow him to fix things, isn’t a magician. But somehow he summoned her and they’ve now got a bond. She tells him that her class and name are Saber. Rin shows up and takes them to a priest who is the referee of this Holy Grail war. 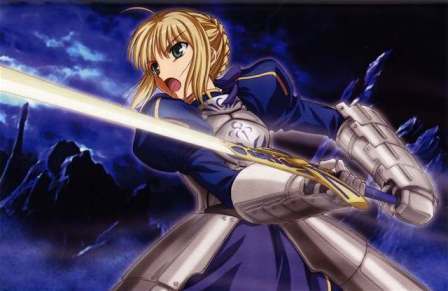 By the fourth episode, both Saber and Shiro are both injured but decide to fight on in order to win the Grail. Both have their own reasons: Shiro is fighting because 10 years earlier, as he finds out, there was another war for the Grail that wound up destroying part of the city and took the lives of his parents. The man who adopted him was a magician who apparently took part in this war. Saber is fighting for her own reasons, but they aren’t made clear.